Dendritic cells (DC) are professional APCs that play a critical role in regulating immunity. In DC, maturation-induced changes in MHC class II expression and Ag presentation require transcriptional regulation by CIITA. To study the role of CIITA in DC, we evaluated key cell functions in DC from CIITA-deficient (CIITA−/−) mice. The ability to take up Ag, measured by fluid phase endocytosis, was comparable between CIITA−/− and control DC. Although CIITA−/− DC lack MHC class II, they maintained normal expression of costimulatory molecules CD80, CD86, and CD40. In contrast, CIITA−/− DC activated with LPS or CpG expressed increased IL-10 levels, but normal levels of TNF-α and IL-12 relative to control. Enhanced IL-10 was due to greater IL-10 mRNA in CIITA−/− DC. Aβ−/− DC, which lack MHC class II but express CIITA normally, had exhibited no difference in IL-10 compared with control. When CIITA was cotransfected with an IL-10 promoter-reporter into a mouse monocyte cell line, RAW 264.7, IL-10 promoter activity was decreased. In addition, reintroducing CIITA into CIITA−/− DC reduced production of IL-10. In all, these data suggest that CIITA negatively regulates expression of IL-10, and that CIITA may direct DC function in ways that extend beyond control of MHC class II. Dendritic cells (DC)4 are specialized APCs with important functions in T cell activation and initiation of immune responses (1). During their life cycle, DC progress through two phenotypically distinct stages, immature and mature (2). Immature DC, which comprise most peripheral DC, are specialized for Ag uptake but lack the capacity to produce cytokines or activate T cells. Exposure to inflammatory stimulus triggers DC to undergo a phenotypic shift into mature DC, wherein DC migrate to lymphoid centers and mature into highly potent T cell activators. Mature DC lose their capacity for Ag uptake but increase their assembly of MHC class II-Ag complexes, expression of cell surface costimulatory molecules, and production of cytokines, which are critical to activate immune responses. Professional APC, including DC, play a crucial role in immunity by processing and displaying exogenous Ags using the MHC class II. CIITA, a non-DNA binding transcription factor, is a key regulator of MHC class II and other genes related to Ag presentation (3, 4, 5). CIITA can also modulate immune responses by regulating transcription of other genes, including IL-4, collagen α2, Fas ligand, and plexin A1 (6, 7, 8, 9, 10, 11, 12). Three different isoforms of CIITA have been identified, each transcribed from a separate promoter (13). Alternative splicing of these transcripts produces isoform-specific mRNAs that differ in the first exon, so that isoforms share four common domains (acidic domain, proline/serine/threonine-rich domain, GTP binding domain, and leucine-rich repeats) but have unique N-terminal sequences (14). DC have been reported to express all three isoforms of CIITA: type I (expressed only in cells of the monocyte lineage and containing a unique N-terminal caspase recruitment domain), type III (also expressed in B cells), and type IV (whose expression is induced by IFN-γ) (13, 15, 16, 17). Type I and type III CIITA comprise most of the CIITA expressed by immature DC, but maturation induces a precipitous decline in levels of type I and type III CIITA mRNA and protein (16, 18). This decrease correlates with the shutdown of MHC class II transcription and the shift from Ag processing to Ag presentation (16). Although CIITA has been studied extensively in the context of MHC class II regulation, it is less clear what other functions it may serve in DC. To study the role of CIITA in DC development and function, we performed an in depth analysis of DC from CIITA-deficient (CIITA−/−) mice. We found that despite their lack of MHC class II, CIITA−/− DC were still capable of differentiating from bone marrow precursors and expressed key costimulatory molecules on the cell surface. We also observed that the CIITA−/− DC had unimpaired capacity for fluid-phase Ag uptake. However, while expression of IL-12, IL-6, and TNF-α occurred at normal levels in the CIITA−/− DC, IL-10 mRNA and protein were increased. Enhanced IL-10 production was also observed in CIITA−/− B cells, suggesting that the difference is not limited to DC. We observed that constitutive expression of CIITA via retroviral transduction results in decreased IL-10 in DC from CIITA−/− mice. Our data demonstrate that CIITA negatively regulates expression of IL-10, and that CIITA may direct DC function in ways that extend beyond control of MHC class II. CIITA−/− mice were as previously described (17). Aβ−/− and C57BL/6 mice were purchased from Taconic Farms and The Jackson Laboratory, respectively. All mice were maintained under specific pathogen-free conditions at the Indiana University School of Medicine animal facility. Bone marrow-derived DC were prepared as previously described (19). Briefly, total bone marrow cells were extracted from mouse femurs and tibiae and depleted of erythrocytes, T cells, B cells, and MHC class II-positive cells. Bone marrow precursors were then cultured for 5 days in RPMI 1640 supplemented with 5% FBS, 10 ng/ml recombinant mouse GM-CSF (BD Pharmingen) and 20 μg/ml gentamicin. After 48 h of culture, nonadherent cells were removed carefully and fresh media were added. After 5 days of culture, immature DC were disaggregated by pipetting and mature DC were generated by replating 1 × 106 cells/ml in the presence of 2.5 μg/ml LPS (E. coli O55:B5 serotype; Sigma-Aldrich) or 2 μg/ml CpG (cytosine/phosphate/guanine dinucleotide-rich sequence: TCCATGACGTTCCTGATGCT) for 2 days. Cells cultured for 7 days were used as immature DC. Splenic DC were isolated by positive selection with CD11c magnetic microbeads (Miltenyi Biotech). Following isolation, splenic DC were cultured at a density of 5 × 105 cells/ml in RPMI 1640 supplemented with 5% FBS and activated for 24 or 48 h in the presence of 2.5 μg/ml LPS. Splenic B cells were enriched by positive selection with B220 magnetic microbeads (Miltenyi Biotech). B cells were cultured at a density of 3 × 106 cells/ml in RPMI 1640 with 10% FBS and stimulated for 24 or 72 h with 5 ng/ml recombinant mouse IL-4 (BD Pharmingen), and 4 μg/ml LPS (Sigma-Aldrich). Phoenix-ECO cells were maintained in DMEM (Invitrogen Life Technologies) with 10% FBS and 100 mM HEPES. RAW 264.7 cells were maintained in DMEM with 10% FBS. All culture media were supplemented with 50 μM 2-ME, 2 mM l-glutamine, 1.5 g/L sodium bicarbonate, and 100 μg/ml penicillin and streptomycin. For cell surface staining, Abs specific for mouse CD11c (integrin α2 and αX chains, clone HL3), CD11b (Mac-1/integrin αM chain, clone M1/70), CD45R (B220, clone RA3-6B2), CD40 (clone 3/23), CD54 (ICAM-1, clone 3E2), CD80 (B7-1, clone 16-10A1), CD86 (B7-2, clone GL-1), MHC class I (H-2Kb, clone AF6-88.5), and MHC class II (Aβb/I-Ab, clone AF6-120.1) were obtained from BD Biosciences. Flow cytometric analysis was performed using a FACScan or FACSCalibur and analyzed using CellQuest software (BD Biosciences). DC from C57BL/6 or CIITA−/− mice were differentiated as described above, except for maturation stimulus, LPS (250 ng/ml), recombinant mouse TNF-α (10 ng/ml; BD Pharmingen), and IL-4 (10 ng/ml; BD PharMingen), to obtain mature DC. DC were collected by pipetting, and 2.5 × 106 cells were resuspended in 250 μl of media containing 25 μg/ml FITC-dextran (40 kDa; Sigma-Aldrich). After 90 min of incubation with the FITC-dextran at 4°C or 37°C, cells were washed three times with ice-cold PBS with 1% FBS, then stained for cell surface CD11c, and analyzed by FACS. FSC-high and CD11c-positive cells were gated, and the fraction of FITC-positive cells was calculated. Values were normalized to the C57BL/6 immature DC sample (set as 1). Within each experiment, triplicates of each sample were incubated and stained independently. ELISAs were used to assay for IL-6, IL-10, IL-12 p40/70, IL-12 p70, and TNF-α in culture supernatants as previously described (6). Purified anti-mouse capture and biotinylated detection Abs were as follows: IL-10: JES5-2A5, SXC-1; IL-12 p40/70: C15.6, C17.8; IL-12p70: 9A5, C17.8; IL-6: P5-20F3, MP5-32C11; TNF-α: G281-2626, MP6-XT3 (BD PharMingen). Tertiary detection was performed with avidin-conjugated alkaline phosphatase (A7294; Sigma-Aldrich) and p-nitrophenyl phosphate substrate (104-0; Sigma-Aldrich). A standard curve for each assay was generated with a known concentration of murine recombinant cytokines (BD PharMingen). Total RNA was prepared using TRIzol (Invitrogen Life Technologies), and cDNA was prepared as described (20). Quantitative real-time PCR of mouse and IL-10 and IL-6 was performed by the comparative threshold cycle (ΔCT) method and normalized to mouse GAPDH as described (11). Mouse IL-10 primer sequences and concentrations were as follows: forward: 5′-ATTTGAATTCCCTGGGTGAGAAG-3′ (300 nM), reverse 5′-CACAGGGGAGAAATCGATGACA-3′ (300 nM); product size, 75 bp. Mouse IL-6 primer sequences and concentrations were as follows: forward: 5′-GGCCTTCCCTACTTCACAAG-3′ (300 nM), reverse 5′-ATTTCCACGATTTCCCAGAG-3′ (300 nM); product size, 125 bp. The following DNA constructs were as described previously: FLAG-tagged type I and type III CIITA, and the expression vector pcDNA3 (15); CIITA domain mutants encoding residues 1–331, 408–857, and 990-1130 (7); the D1 luciferase reporter construct containing the mouse IL-10 promoter (802 bp) in pGL-3 Basic vector (21, 22); CMV promoter-driven β-galactosidase (β-gal) (6). For functional studies of promoter activity, 7.5 × 105 RAW 264.7 cells were transiently transfected with Lipofectamine and Lipofectamine Plus reagents (Invitrogen Life Technologies) using 1 μg of IL-10 promoter, 1 μg β-gal reporter and 1 μg type I or type III CIITA, or vector. Three hours after transfection, media was changed and cells were pooled together, then split into two samples. Cells were rested for 3 h, then left in culture (unstimulated) or stimulated with 2.5 μg/ml LPS for 20 h. Cell lysates were prepared and used for luciferase and β-gal assays as described (6). Relative luciferase activity was calculated using the luciferase activity of cells transfected with reporter DNA alone. Each transfection was performed in duplicate and values represent the average of at least three transfections. Retroviral constructs expressing eGFP (RV-GFP) and eGFP with type III CIITA (RV-GFP/type III CIITA) in the MSCV2.2 vector were generated as described (11). To generate type I CIITA-expressing retrovirus (RV-GFP/type I CIITA), the type I isoform of CIITA (15) was cloned into the XhoI site of the modified MSCV2.2 vector containing the internal ribosome entry site and eGFP. Retrovirus was generated in Phoenix-Eco packaging cells as previously described (11). Briefly, Phoenix-Eco cells were transiently transfected with RV-CIITA/GFP (type I or type III) or RV-GFP using the CaPO4 method (23). The transfected Phoenix-Eco cells were cultured at 37°C for 12–18 h, then at 32°C for an additional 24 h to allow efficient viral production. The supernatants containing either the GFP or CIITA/GFP viruses were filtered through a 0.45-μm syringe filter (Millipore) and used immediately to transduce differentiating primary DC at day 1 of DC culture. Retroviral transduction was performed by adapting a previously described method (24, 25). Virus was supplemented with 8 μg/ml polybrene (hexadimethrine bromide, H-9268; Sigma-Aldrich) and added to DC after 1 day of DC culture. Tissue culture plates were spun in a table-top centrifuge at 32°C and 2000 rpm (863 × g) for 120 min. Virus was removed and fresh medium was added. After 5 days of culture, transduced DC were sorted for retrovirus-infected (CD11c+GFP+) and uninfected (CD11c+GFP−) populations using a FACSVantage (BD Biosciences). Sorted cells were replated at 5 × 105 cells/ml in RPMI 1640 with 5% FBS and rested for 12–14 h in culture. DC were then matured for 48 h by the addition of 2.5 μg/ml LPS. After 2 days of stimulation, supernatants were analyzed by ELISA. To analyze CIITA−/− DC, we first examined DC from the bone marrow (BM) of CIITA−/− mice. Bone marrow-derived DC from control (C57BL/6) or CIITA−/− mice were differentiated for 5 days in the presence of GM-CSF, matured for 2 days with LPS, then analyzed for expression of cell surface markers, including costimulatory molecules. As shown in Fig. 1⇓A, the CIITA−/− DC had similar populations of CD11c+, CD11b+, and CD8α− DC as control DC, suggesting that GM-CSF-mediated differentiation of BM-derived DC can occur despite the absence of CIITA. CIITA−/− DC also expressed wild-type levels of MHC class I, the costimulatory molecules CD40, CD80 (B7-1), and CD86 (B7-2), and CD54 (ICAM-1). MHC class II was absent from CIITA−/− DC. Phenotypic comparison of CIITA−/− DC. A, CIITA−/− DC lack MHC class II but express DC surface markers and costimulatory molecules. Bone marrow-derived DC from control (C57BL/6) or CIITA−/− mice were differentiated for 5 days in the presence of GM-CSF, then matured for 2 days with LPS (2.5 μg/ml). Flow cytometric analysis was performed for cell surface CD11c, CD11b (Mac-1), CD8α, MHC class II (I-Ab), MHC class I (H-2Kb), CD54 (ICAM-1), CD40, CD80 (B7-1), and CD86 (B7-2). B and C, CIITA−/− DC endocytose at wild-type levels. Immature and mature DC from control or CIITA−/− mice were cultured for a total of 7 days. Mature DC received 2 days’ stimulation with LPS (250 ng/ml), TNF-α (10 ng/ml), and IL-4 (10 ng/ml). Collected DC were incubated with FITC-dextran, washed, and stained for cell surface markers. Live, CD11c+ cells were gated and the fraction of FITC-positive cells was calculated as shown in B. Each experiment had triplicates of each sample that underwent independent incubation and staining. Values in C were normalized to the wild-type immature sample (set as 1) and represent the mean and SD of three independent experiments. Before presenting exogenous Ags on MHC class II, DC must first internalize them. Thus, we next tested fluid-phase endocytosis of FITC-labeled dextran as a measurement of Ag uptake. Immature and mature bone marrow-derived DC from control (C57BL/6) or CIITA−/− mice were incubated with FITC-dextran, with incubation at 4°C used as a baseline for nonspecific binding. We found that uptake of FITC dextran by immature CIITA−/− DC at 37°C occurred at the same level as that of immature control DC (Fig. 1⇑, B and C). DC exhibit a characteristic decrease in Ag uptake upon maturation. We also observed this decrease in both control and CIITA−/− DC, suggesting that CIITA−/− DC are also capable of down-regulating Ag uptake function during the phenotypic shift from immature to mature DC. Cytokine production by DC is an important component of T cell activation and immune signaling. Cytokines produced by DC can serve to activate T cells and direct the course of T cell differentiation and immune responses. To determine whether the cytokine profile of CIITA−/− DC differs from that of wild type, we measured the amount of IL-10 and TNF-α released by LPS-stimulated bone marrow-derived DC from control (C57BL/6) or CIITA−/− mice. Although comparable levels of TNF-α were observed for control and CIITA−/− DC, the CIITA−/− DC produced about twice as much IL-10 protein (Fig. 2⇓A, top panels). Becauseproduction of IL-10 has been associated with decreased IL-12 production (26, 27), we also examined production of IL-12 (p40 subunit and assembled p70). Similar levels of IL-12 protein were produced by control and CIITA−/− DC (Fig. 2⇓A, bottom panels). CIITA−/− DC express increased IL-10. A, Comparison of cytokine production by wild-type and CIITA−/− DC. Bone marrow-derived DC from control (C57BL/6), CIITA−/−, and Aβ−/− mice were cultured for 5 days; then DC at a density of 1 × 106 cells/ml were matured with LPS (2.5 μg/ml). After 2 days of stimulation, supernatants were harvested and cytokine expression was analyzed by ELISA. Data are the mean and SD of three independent experiments. B, CIITA−/− DC express increased IL-10 mRNA. Control and CIITA−/− DC were prepared as in A, then used to prepare RNA for qRT-PCR of IL-10 and IL-6 mRNA after 1 day of stimulation. Expression was normalized to GAPDH using the ΔCT method and is shown relative to control. Data are the mean and SD of three independent experiments. C, IL-10 induction correlates with decreased CIITA expression during DC maturation. DC from control mice were prepared as in B, then used to isolate RNA for qRT-PCR of IL-10 and CIITA mRNA. Expression was normalized to GAPDH and is shown relative to immature cells. Data are the mean and SD of three independent experiments. Because CIITA is required for transcription of MHC class II, CIITA−/− mice also lack MHC class II (17). To determine whether the increased IL-10 production arises directly from the absence of CIITA or is a secondary effect of MHC class II deficiency, we also compared cytokine production by DC from Aβ−/− mice, which lack MHC class II but express normal levels of CIITA. The levels of IL-10, IL-12, and TNF-α protein produced by Aβ−/− DC were similar to those from control DC (Fig. 2⇑A). Thus, the increase in IL-10 protein is associated with the absence of CIITA, not MHC class II. To determine whether differences in IL-10 protein could be attributed to differences in mRNA, we also compared IL-10 mRNA levels in BM-derived DC from control (C57BL/6) and CIITA−/− mice. Using qRT-PCR, we observed a 2-fold increase in IL-10 mRNA from CIITA−/− DC relative to control (Fig. 2⇑B). In contrast, IL-6 mRNA levels were similar in both samples (Fig. 2⇑B). Thus, the increased IL-10 protein correlates with an increase in IL-10 mRNA. So far, our data suggest that CIITA down-regulates IL-10 gene expression. If this is the case, an inverse correlation between CIITA and IL-10 gene expression in normal DC is expected. When we compared IL-10 and CIITA mRNA levels between immature and mature DC, the amount of IL-10 mRNA was increased upon maturation while CIITA expression declined. Maturation of DC is triggered by the recognition of pathogenic markers through pattern recognition receptors, the TLR, which are specific for unique products of bacteria and other pathogens (28). The quantity and combination of cytokines produced by mature DC can vary depending on the maturation stimulus received (29). We wished to determine whether CIITA−/− DC would also express increased IL-10 when matured with another activation stimulus, CpG. In contrast to LPS, a product of Gram-negative bacteria recognized by TLR4, unmethylated CpG motifs are present in viral and bacterial DNA and are recognized by TLR9 (29). As with LPS-stimulated DC, CIITA−/− DC stimulated by CpG exhibited enhanced production of IL-10 (Fig. 3⇓). The relative increase between CIITA−/− DC and control was ∼2- to 3-fold for DC matured with either LPS or CpG. Both control and CIITA−/− DC matured with CpG exhibited decreased IL-10 and IL-6, but increased IL-12, relative to LPS-matured DC. CIITA−/− DC express increased IL-10 upon stimulation with either LPS or CpG. DC from control (C57BL/6) or CIITA−/− mice were cultured for 5 days, then replated at a density of 1 × 106 cells/ml and matured with either LPS (2.5 μg/ml) or CpG (2 μg/ml). After 2 days of stimulation, supernatants were harvested and cytokine expression was analyzed by ELISA. Data are the mean and SD of two independent experiments. DC include several subsets that can be divided by developmental origin, cell surface phenotype, functional capacities, and localization within in the body (29, 30). Bone marrow-derived DC are in vitro-differentiated cells and consist primarily of CD11c+CD11b+B220− DC of myeloid origin (30). In contrast, DC isolated from the spleen have differentiated in vivo and also include CD11b− and B220+ populations of lymphoid origin (30). Having observed differences in IL-10 expression in CIITA−/− bone marrow-derived DC, we next asked whether other populations of CIITA−/− DC possessed the same phenotype. Splenic DC from CIITA−/− mice showed similar myeloid (CD11c+CD11b+) and lymphoid (CD11c+CD11b−) DC compared with control (Fig. 4⇓, A–C). However, when we examined B220 expression in the two subpopulations, CIITA−/− spleen had consistently fewer CD11c+CD11b−B220+ cells (Fig. 4⇓B). Splenic DC from CIITA−/− mice express normal IL-10. A, Comparison of subpopulations in control and CIITA−/− splenic DC. CD11c+ DC were enriched from control (C57BL/6) or CIITA−/− mouse splenocytes using magnetic selection, then analyzed for CD11c+CD11b− and CD11c+CD11b+ subpopulations. Labels indicate each subpopulation as a percentage of live DC. B and C, Relative expression of B220 in subpopulations of control and CIITA−/− splenic DC. Control and CIITA−/− splenic DC from A were gated on CD11c+CD11b− (B) or CD11c+CD11b+ (C) cells and were analyzed for expression of cell surface B220. Labels indicate B220+ cells as a percentage of gated DC. D, Comparison of IL-10 and IL-6 production by control and CIITA−/− splenic DC. CD11c+ splenic DC from control (C57BL/6) and CIITA−/− mice were enriched using magnetic selection, then plated at a density of 1 × 106 cells/ml and stimulated with CpG (2 μg/ml). After 1 day of stimulation, supernatants were harvested and analyzed by cytokine ELISA for IL-10 and IL-6. Data are the mean and SD of three independent experiments. ∗, Not detectable. The detection limit for IL-10 and IL-6 was 31.25 and 62.5 pg/ml, respectively. To assess IL-10 production by splenic DC, CD11c+ cells were enriched and activated with either LPS or CpG. The total amount of IL-10 and IL-6 produced by splenic DC was much less than with the BM-derived DC (Fig. 4⇑D). In contrast to BM-derived DC, splenic DC produced greater IL-10 when stimulated with CpG than with LPS, and CpG-stimulated splenic DC from CIITA−/− mice produced IL-10 at levels comparable to control (Fig. 4⇑D). IL-10 from LPS-stimulated DC fell near or below the threshold of detection by ELISA and could not be accurately quantified (data not shown). Because CIITA−/− DC produce greater IL-10, we next wished to determine whether other types of APC would also express increased IL-10 in the absence of CIITA. Because B cells express IL-10 and CIITA, we tested production of IL-10 in CIITA−/− B cells. B220+ cells were enriched from CIITA−/− or control (C57BL/6) splenocytes using magnetic microbeads and stimulated with LPS and IL-4 for 3 days. We found that the CIITA−/− B cells produce 2- to 3-fold more IL-10 protein than control B cells (Fig. 5⇓A). 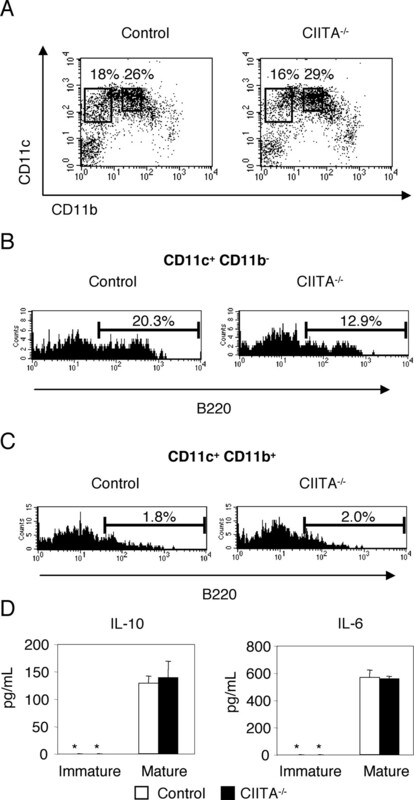 Levels of IL-6 were comparable between the CIITA−/− and control B cells (Fig. 5⇓A). To determine whether this difference correlated with changes in levels of IL-10 mRNA, we activated CIITA−/− or control B220+ cells with LPS and IL-4 for 24 h, then assessed IL-10 mRNA levels using qRT-PCR. We observed a ∼2-fold increase in IL-10 mRNA in the CIITA−/− B cells relative to control (Fig. 5⇓B). Greater IL-10 protein and mRNA were also expressed in CIITA−/− B cells activated with LPS alone, although the overall expression of IL-10 was much lower (data not shown). Overall, we observed enhanced expression of IL-10 in CIITA−/− B cells, with a fold increase on the same order as with DC. CIITA−/− B cells express increased IL-10 protein and mRNA. 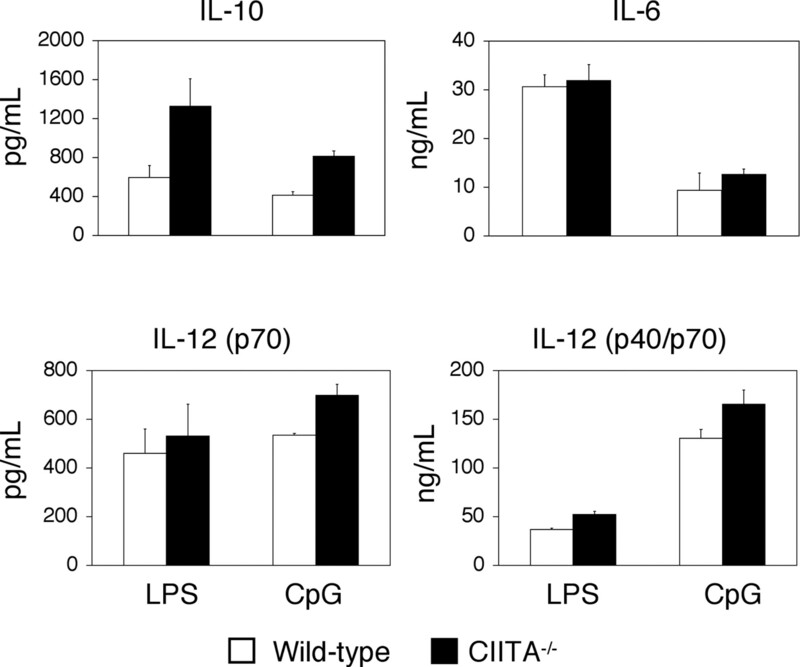 A, Comparison of IL-10 and IL-6 production by control and CIITA−/− B cells. B220+ B cells selected from control (C57BL/6) or CIITA−/− mouse splenocytes were enriched using magnetic selection, then plated at a density of 3 × 106 cells/ml and stimulated with LPS (4 μg/ml) and IL-4 (5 ng/ml). After 3 days of stimulation, supernatants were harvested and analyzed by cytokine ELISA for IL-10 and IL-6. Data are the mean and SD of three independent experiments. 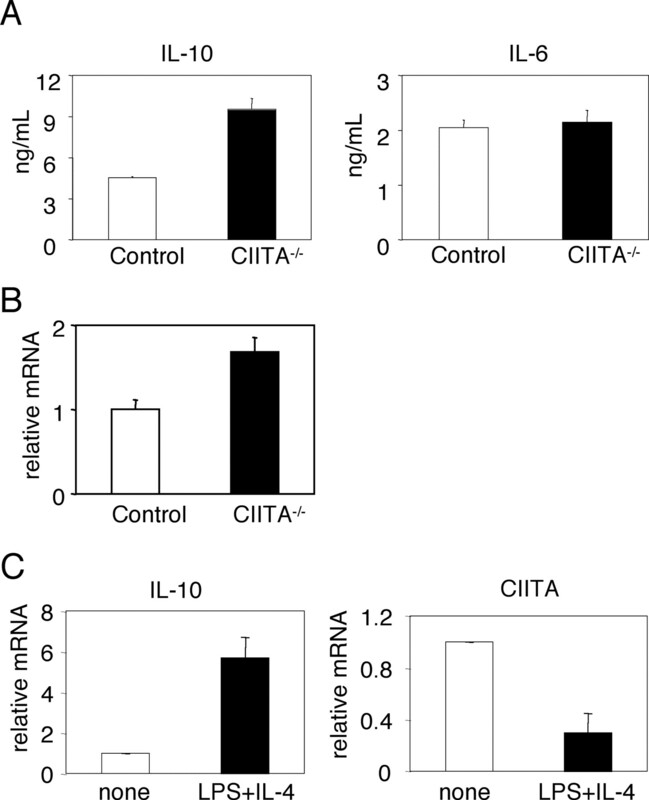 B, Comparison of IL-10 mRNA in control and CIITA−/− B cells. B220+ B cells were isolated as in A, stimulated with LPS (4 μg/ml) and IL-4 (5 ng/ml) for 24 h, and used to prepare RNA for qRT-PCR. IL-10 signals were normalized to GAPDH using the ΔCT method and expressed relative to control. Data are the mean and SD of two independent experiments. C, IL-10 induction correlates with decreased CIITA expression upon activation of splenic B cells. B220+ B cells from control mice were prepared as in B, then used to isolate RNA for qRT-PCR of IL-10 and CIITA. Expression was normalized to GAPDH and is shown relative to immature cells. Data are the mean and SD of two independent experiments. To assess whether B cells also exhibit an inverse correlation between IL-10 and CIITA gene expression upon activation by LPS, we measured mRNA levels of IL-10 and CIITA using freshly isolated splenic B cells as well as activated B cells. Consistent with DC, IL-10 expression was induced but the CIITA gene was down-regulated in activated B cells (Fig. 5⇑C). We wanted to find out whether the difference observed in IL-10 expression could be attributed to the regulation of IL-10 promoter activity by CIITA. To study this, we used a luciferase reporter driven by 802 bp of the IL-10 promoter. For the transfection experiments, we chose the RAW 264.7 mouse monocyte/macrophage cell line, which has been used for previous studies with this IL-10 reporter (21). When RAW 264.7 cells were transfected with the IL-10 reporter and type III CIITA, luciferase activity at the IL-10 reporter was decreased (Fig. 6⇓). Cotransfection with type I CIITA also produced decreased activity at the IL-10 reporter construct (Fig. 6⇓), suggesting that both isoforms are equally capable of repressing the IL-10 promoter. CIITA decreases IL-10 promoter activity. A, RAW 264.7 cells were transfected with IL-10 promoter-driven luciferase reporter plus control vector, or the expression vector for type I or type III CIITA. Cells were left unstimulated or were activated with LPS (2.5 μg/ml) for 20 h, then assessed for luciferase activity (normalized to β-gal). Data are the mean and SDs of three independent experiments. B, Domain structure of CIITA. CIITA mutants used include the acidic and proline/serine/threonine-rich region (aa 1–331), the GTP binding domain (aa 408–857), and the leucine-rich repeats (aa 980-1130). 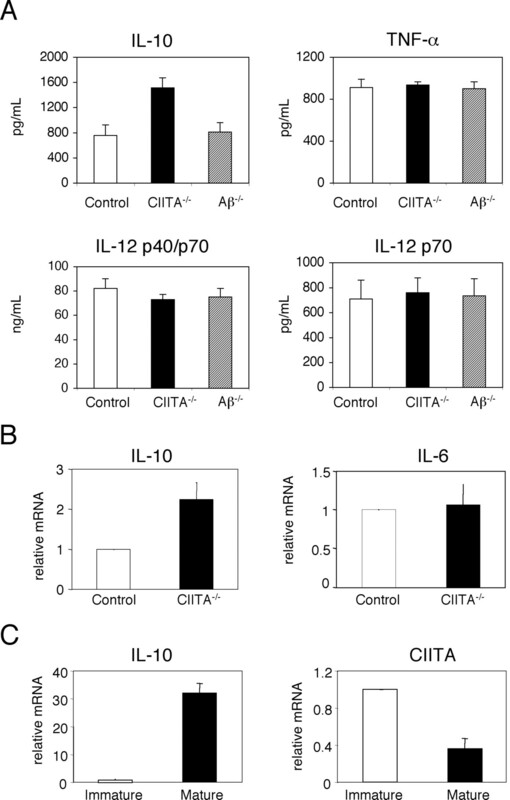 C, Effects of CIITA domains on IL-10 promoter. RAW 264.7 cells were transfected with IL-10 promoter plus control vector, full-length type III CIITA (aa 1–1130), or CIITA domain mutants as described in B. 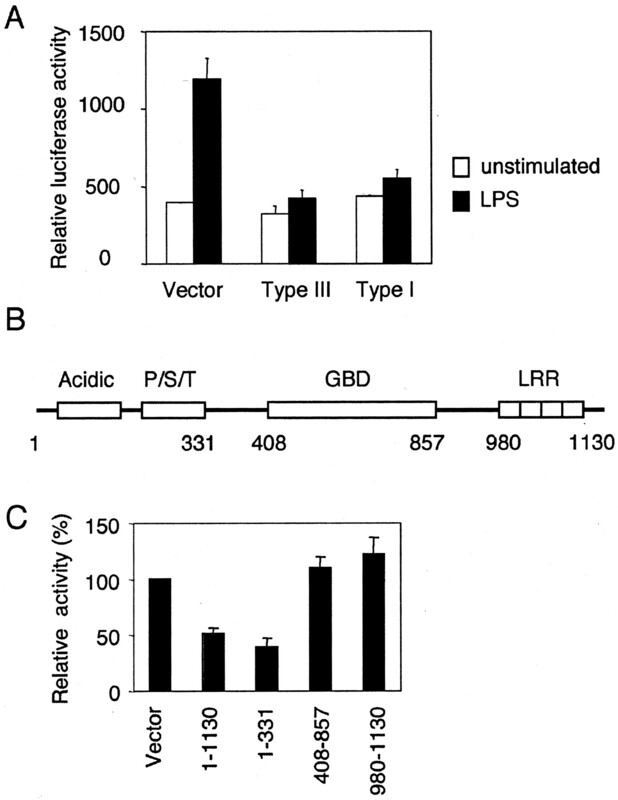 Cells were activated with LPS for 20 h, then assessed for luciferase activity. Values were normalized to β-gal and shown relative to control. Data are the mean and SDs of three independent experiments. To provide further evidence in support of CIITA as a negative regulator of IL-10, we used a retroviral system to reintroduce CIITA into CIITA−/− DC. Bone marrow precursors from control or CIITA−/− mice were differentiated to DC and transduced with retroviruses expressing GFP alone, GFP and type III CIITA, or GFP and type I CIITA. Transduced DC were then sorted based on GFP and CD11c expression, matured with LPS, and analyzed. As shown in Fig. 7⇓A, efficiency of transduction was comparable between the CIITA and the control viruses. Cells transduced with virus expressing CIITA were MHC class II positive, indicating that transducing CIITA was capable of inducing MHC class II expression (Fig. 7⇓B). Consistent with our previous findings (15), we observed that transduction with the type I CIITA virus resulted in higher expression of cell surface MHC class II in mature cells. The difference in MHC class II levels was not observed in immature cells, probably because DC sequester MHC class II protein within the cell until maturation. CIITA−/− DC transduced with CIITA produce decreased IL-10. A, Transduction of CIITA−/− DC. BM-derived DC prepared from CIITA−/− mice were transduced with retrovirus encoding GFP and type III or type I CIITA, or GFP alone (vector). Cells were analyzed after for 5 days of culture. Numbers represent the percent CD11c+GFP− and CD11c+GFP+ cells as a fraction of total cells. B and C, Analysis of CIITA−/− DC transduced with CIITA. GFP+CD11c+ (transduced) or GFP−CD11c+ (nontransduced) cells shown in A were sorted, replated at a density of 5 × 106 cells/ml, rested overnight, and stimulated for 2 days with 2.5 μg/ml LPS (mature). Immature cells were cultured for 5 days without sorting. GFP− or GFP+ cells were analyzed for cell surface MHC class II (I-Ab) expression (B), or supernatants were collected and cytokine production assessed by ELISA (C). Data are representative (B) or the mean and SD (C) of three independent experiments. We next tested IL-10 production to determine whether transduced CIITA would affect expression of IL-10. IL-10 production by CD11c+GFP+ cells was reduced in DC infected with either of the CIITA viruses, relative to control (Fig. 7⇑C, left panel). To confirm that this change was specific to IL-10, we also compared levels of IL-6 and IL-12 (p40/70) protein. IL-6 was comparable among all samples, while IL-12 was slightly increased with the CIITA-transduced DC (Fig. 7⇑C). Nontransduced (CD11c+GFP−) DC populations showed similar levels of IL-10 production regardless of virus (data not shown). We observed that CIITA−/− DC were phenotypically similar to wild-type DC for certain indicators of maturation (expression of costimulatory molecules and production of cytokines other than IL-10). However, expression of IL-10 was increased in CIITA−/− BM-derived DC matured with either LPS or CpG, as well as in CIITA−/− B cells. Increased IL-10 production has many potential implications for the behavior of CIITA−/− DC. IL-10 is an immunomodulatory cytokine that plays a key role in down-regulating inflammatory responses (31). DC and other APC exposed to exogenous IL-10 during differentiation can exhibit altered maturation responses and decreased ability to stimulate T cells (32, 33). Although we were not able to test T cell activation by CIITA−/− DC because of the lack of MHC class II, we were able to study cytokine production by BM-derived DC. In mature DC, IL-10 can inhibit production of IL-12 (27) and negatively affect DC capacity for T cell activation (31, 34, 35). Although we did not observe a difference in IL-12 production from CIITA−/− DC, we did find that CIITA−/− DC transduced with CIITA, which had decreased IL-10, produced slightly greater IL-12. In addition to activating T cells, DC also regulate immunity by influencing polarization of T cells to Th1 or Th2, or by inducing a suppressor phenotype. Expression of IL-10 by DC can direct the polarization of naive T cells to T regulatory cells, as well as inhibit cytokine production and T cell proliferation (33, 36). Thus, it is possible that the increased IL-10 production by CIITA−/− DC could promote induction of regulatory T cells by DC, or produce altered cytokine production by interacting T cells. 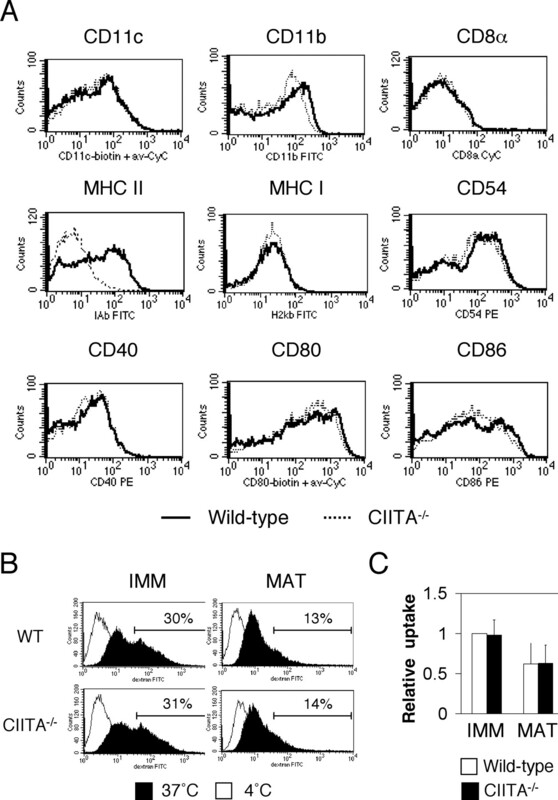 Like CIITA−/− DC, CIITA−/− CD4+ T cells exhibit aberrant expression of specific cytokines. In the case of CD4+ T cells, this appears as increased production of Th2 cytokines by Th1-differentiated cells (6). It does not seem likely that the expression observed in T cells can be attributed to the effects of IL-10 production by CIITA−/− DC on activated T cells, because IL-10 alone is not capable of directing T cells toward a Th2 phenotype and no large differences were observed in expression of other cytokines. However, CIITA−/− APC also play an important role much earlier in the T cell life cycle when interacting with developing T cells in the thymus. Alternatively, it is also possible that the kinds of mechanisms produce abnormal expression of different cytokines in the two different cell types; that is, that the differences in cytokine production by T cells and DC represent two different manifestations of the same underlying phenomenon. Individuals with a genetic defect in the CIITA gene exhibit immunodeficiency primarily due to the lack of MHC class II and CD4 T cells and are known as bare lymphocyte syndrome (BLS) patients. Although it is not clear whether BLS patients produce more IL-10, it is possible that increased IL-10 partly contributes to immunosuppression that is often associated with BLS patients. However, it would be difficult to assess the role of IL-10 in the context of host immunity because Ag presentation function is impaired in BLS patients. Splenic DC from CIITA−/− mice exhibited a slightly smaller subpopulation of CD11c+CD11b−B220+ DC, considered to be murine plasmacytoid DC (37, 38). The significance of this finding remains to be investigated. Differences in B220 expression by DC may indicate some differences in developmental origin caused by CIITA deficiency. Plasmacytoid DC express increased IFN-α and decreased IL-12; they are also poor T cell activators (30, 37, 38, 39). It is not clear whether the change in this population in CIITA−/− DC is related to aberrant cytokine expression, or represents an alteration in DC development. Although CIITA−/− DC derived from bone marrow produced greater IL-10, splenic DC did not. This may reflect a developmental difference, because the BM-derived DC were cultured in vitro while splenic DC had differentiated in vivo. Origin of DC precursors may also account for the differences, because splenic DC represent multiple populations of DC from both myeloid and lymphoid origins. Indeed, a recent report showed that plasmacytoid DC differ from the rest of DC subsets with respect to expression of CIITA and MHC class II (40). Unlike other DC subsets, they do not down-regulate the CIITA gene upon maturation. Moreover, CpG treatment enhanced CIITA gene expression. Therefore, it is not surprising to see different mechanisms of IL-10 regulation between splenic DC and BM-derived DC. The limited number of DC obtained from spleen precludes studies of IL-10 expression by individual subsets, but it would be interesting to study cytokine production in the different populations. Multiple means for regulating expression of IL-10 have been reported. On the level of transcriptional regulation, transcription of IL-10 requires binding of the ubiquitous transcription factors Sp1 and Sp3 to recognition sites in the IL-10 promoter (21, 41). The 3′-untranslated region of the IL-10 mRNA contains destabilizing sequences that negatively affect mRNA stability and production (21, 22). Additionally, multiple studies have found that inducing cAMP and protein kinase A can enhance production of IL-10 (42, 43, 44). We observed that the increase in IL-10 protein in CIITA−/− DC correlated with greater expression of IL-10 mRNA, which could be attributed to increased transcription of IL-10, greater message stability, or a combination of the two. The two CIITA isoforms primarily expressed in DC, type I and type III, equally inhibited activity at the IL-10 promoter, shown in the transient transfection assay. Both isoforms decreased IL-10 expression in retrovirally transduced DC, with type I CIITA having slightly a greater effect. Interestingly, the effects of CIITA on IL-10 differ from CIITA-mediated repression of cathepsin E, which can be mediated by type III but not type I CIITA (45). Thus, inhibition by CIITA seems to be mediated by a different mechanism depending on the target gene. It is unclear whether the phenotype observed in CIITA−/− DC arises from specific regulatory effects of CIITA on IL-10 or as the result of altered DC development in the absence of CIITA. In the case of IL-4 and collagen α2, two of the other genes repressed by CIITA, inhibition is mediated by competing key coactivators away from the promoter (7, 8). Regulation of IL-10 could potentially arise from a more generalized regulation of the IL-10 locus; however, no such function has yet been reported for CIITA. Overall, we found that while CIITA−/− DC express most of the characteristics of normal DC, they also exhibit a key difference, increased production of IL-10, which may affect how DC shape immune responses. We believe further understanding of how the absence of CIITA results in greater IL-10 expression and affects DC development will provide valuable insight into the function of CIITA, the processes that regulate IL-10, and the physiology of DC. We thank Drs. Amy Chow and Ira Mellman (Yale University School of Medicine) and Dipak Patel (University of Michigan Medical School) for assistance with the DC retrovirus transduction system. ↵1 This work was supported in part by National Institutes of Health Grants AI53556 and AI56097 (to C.-H.C.) and by the Indiana Genomics Initiative of Indiana University. ↵2 Current address: Eli Lilly and Company, Greenfield, IN. ↵4 Abbreviations used in this paper: β-gal, β-galactosidase; DC, dendritic cell; qRT-PCR, quantitative real-time RT-PCR; ΔCT, comparative threshold cycle; BLS, bare lymphocyte syndrome. Lanzavecchia, A., F. Sallusto. 2001. Regulation of T cell immunity by dendritic cells. Cell 106:263. Mellman, I., R. M. Steinman. 2001. Dendritic cells: specialized and regulated antigen processing machines. Cell 106:255. Chang, C. H., R. A. Flavell. 1995. Class II transactivator regulates the expression of multiple genes involved in antigen presentation. J. Exp. Med. 181:765. Steimle, V., L. A. Otten, M. Zufferey, B. Mach. 1993. Complementation cloning of an MHC class II transactivator mutated in hereditary MHC class II deficiency (or bare lymphocyte syndrome). Cell 75:135. Boss, J. M., P. E. Jensen. 2003. Transcriptional regulation of the MHC class II antigen presentation pathway. Curr. Opin. Immunol. 15:105. Gourley, T., S. Roys, N. W. Lukacs, S. L. Kunkel, R. A. Flavell, C. H. Chang. 1999. A novel role for the major histocompatibility complex class II transactivator CIITA in the repression of IL-4 production. Immunity 10:377. Sisk, T. J., T. Gourley, S. Roys, C. H. Chang. 2000. MHC class II transactivator inhibits IL-4 gene transcription by competing with NF-AT to bind the coactivator CREB binding protein (CBP)/p300. J. Immunol. 165:2511. Zhu, X. S., J. P. Ting. 2001. A 36-amino-acid region of CIITA is an effective inhibitor of CBP: novel mechanism of γ interferon-mediated suppression of collagen α2(I) and other promoters. Mol. Cell Biol. 21:7078. Xu, Y., L. Wang, G. Buttice, P. K. Sengupta, B. D. Smith. 2004. Major histocompatibility class II transactivator (CIITA) mediates repression of collagen (COL1A2) transcription by interferon γ. J. Biol. Chem. 279:41319. Gourley, T. S., C. H. Chang. 2001. Cutting edge: the class II transactivator prevents activation-induced cell death by inhibiting Fas ligand gene expression. J. Immunol. 166:2917. Gourley, T. S., D. R. Patel, K. Nickerson, S. C. Hong, C. H. Chang. 2002. Aberrant expression of Fas ligand in mice deficient for the MHC class II transactivator. J. Immunol. 168:4414. Wong, A. W., W. J. Brickey, D. J. Taxman, H. W. van Deventer, W. Reed, J. X. Gao, P. Zheng, Y. Liu, P. Li, J. S. Blum, et al 2003. CIITA-regulated plexin-A1 affects T-cell-dendritic cell interactions. Nat. Immunol. 4:891. Muhlethaler-Mottet, A., L. A. Otten, V. Steimle, B. Mach. 1997. Expression of MHC class II molecules in different cellular and functional compartments is controlled by differential usage of multiple promoters of the transactivator CIITA. EMBO J. 16:2851. Harton, J. A., J. P. Ting. 2000. Class II transactivator: mastering the art of major histocompatibility complex expression. Mol. Cell Biol. 20:6185. Nickerson, K., T. J. Sisk, N. Inohara, C. S. Yee, J. Kennell, M. C. Cho, P. J. Yannie, II, G. Nunez, C. H. Chang. 2001. Dendritic cell-specific MHC class II transactivator contains a caspase recruitment domain that confers potent transactivation activity. J. Biol. Chem. 276:19089. Landmann, S., A. Muhlethaler-Mottet, L. Bernasconi, T. Suter, J. M. Waldburger, K. Masternak, J. F. Arrighi, C. Hauser, A. Fontana, W. Reith. 2001. Maturation of dendritic cells is accompanied by rapid transcriptional silencing of class II transactivator (CIITA) expression. J. Exp. Med. 194:379. Chang, C. H., S. Guerder, S. C. Hong, W. van Ewijk, R. A. Flavell. 1996. Mice lacking the MHC class II transactivator (CIITA) show tissue-specific impairment of MHC class II expression. Immunity 4:167. Pai, R. K., D. Askew, W. H. Boom, C. V. Harding. 2002. Regulation of class II MHC expression in APCs: roles of types I, III, and IV class II transactivator. J. Immunol. 169:1326. Inaba, K., M. Inaba, N. Romani, H. Aya, M. Deguchi, S. Ikehara, S. Muramatsu, R. M. Steinman. 1992. Generation of large numbers of dendritic cells from mouse bone marrow cultures supplemented with granulocyte/macrophage colony-stimulating factor. J. Exp. Med. 176:1693. Chang, C. H., J. D. Fontes, M. Peterlin, R. A. Flavell. 1994. Class II transactivator (CIITA) is sufficient for the inducible expression of major histocompatibility complex class II genes. J. Exp. Med. 180:1367. Tone, M., M. J. Powell, Y. Tone, S. A. Thompson, H. Waldmann. 2000. IL-10 gene expression is controlled by the transcription factors Sp1 and Sp3. J. Immunol. 165:286. Powell, M. J., S. A. Thompson, Y. Tone, H. Waldmann, M. Tone. 2000. Posttranscriptional regulation of IL-10 gene expression through sequences in the 3′-untranslated region. J. Immunol. 165:292. De Veerman, M., C. Heirman, S. Van Meirvenne, S. Devos, J. Corthals, M. Moser, K. Thielemans. 1999. Retrovirally transduced bone marrow-derived dendritic cells require CD4+ T cell help to elicit protective and therapeutic antitumor immunity. J. Immunol. 162:144. D’Andrea, A., M. Aste-Amezaga, N. M. Valiante, X. Ma, M. Kubin, G. Trinchieri. 1993. Interleukin 10 (IL-10) inhibits human lymphocyte interferon γ-production by suppressing natural killer cell stimulatory factor/IL-12 synthesis in accessory cells. J. Exp. Med. 178:1041. Aste-Amezaga, M., X. Ma, A. Sartori, G. Trinchieri. 1998. Molecular mechanisms of the induction of IL-12 and its inhibition by IL-10. J. Immunol. 160:5936. Coutinho, A., A. Poltorack. 2003. Innate immunity: from lymphocyte mitogens to Toll-like receptors and back. Curr. Opin. Immunol. 15:599. Mazzoni, A., D. M. Segal. 2004. Controlling the Toll road to dendritic cell polarization. J. Leukocyte Biol. 75:721. Shortman, K., Y. J. Liu. 2002. Mouse and human dendritic cell subtypes. Nat. Rev. Immunol. 2:151. Renauld, J. C.. 2003. Class II cytokine receptors and their ligands: key antiviral and inflammatory modulators. Nat. Rev. Immunol. 3:667. Nolan, K. F., V. Strong, D. Soler, P. J. Fairchild, S. P. Cobbold, R. Croxton, J. A. Gonzalo, A. Rubio, M. Wells, H. Waldmann. 2004. IL-10-conditioned dendritic cells, decommissioned for recruitment of adaptive immunity, elicit innate inflammatory gene products in response to danger signals. J. Immunol. 172:2201. Moore, K. W., R. de Waal Malefyt, R. L. Coffman, A. O’Garra. 2001. Interleukin-10 and the interleukin-10 receptor. Annu. Rev. Immunol. 19:683. Steinbrink, K., M. Wolfl, H. Jonuleit, J. Knop, A. H. Enk. 1997. Induction of tolerance by IL-10-treated dendritic cells. J. Immunol. 159:4772. Faulkner, L., G. Buchan, M. Baird. 2000. Interleukin-10 does not affect phagocytosis of particulate antigen by bone marrow-derived dendritic cells but does impair antigen presentation. Immunology 99:523. Kapsenberg, M. L.. 2003. Dendritic-cell control of pathogen-driven T-cell polarization. Nat. Rev. Immunol. 3:984. Asselin-Paturel, C., A. Boonstra, M. Dalod, I. Durand, N. Yessaad, C. Dezutter-Dambuyant, A. Vicari, A. O’Garra, C. Biron, F. Briere, G. Trinchieri. 2001. Mouse type I IFN-producing cells are immature APCs with plasmacytoid morphology. Nat. Immunol. 2:1144. Nakano, H., M. Yanagita, M. D. Gunn. 2001. CD11c+B220+Gr-1+ cells in mouse lymph nodes and spleen display characteristics of plasmacytoid dendritic cells. J. Exp. Med. 194:1171. Brawand, P., D. R. Fitzpatrick, B. W. Greenfield, K. Brasel, C. R. Maliszewski, T. De Smedt. 2002. Murine plasmacytoid pre-dendritic cells generated from Flt3 ligand-supplemented bone marrow cultures are immature APCs. J. Immunol. 169:6711. LeibundGut-Landmann, S., J. Waldburger, C. Reise e Sousa, H. Acha-Orbea, W. Reith. 2004. MHC class II expression is differentially regulated in plasmacytoid and conventional dendritic cells. Nat. Immunol. 5:899. Brightbill, H. D., S. E. Plevy, R. L. Modlin, S. T. Smale. 2000. A prominent role for Sp1 during lipopolysaccharide-mediated induction of the IL-10 promoter in macrophages. J. Immunol. 164:1940. Eigler, A., B. Siegmund, U. Emmerich, K. H. Baumann, G. Hartmann, S. Endres. 1998. Anti-inflammatory activities of cAMP-elevating agents: enhancement of IL-10 synthesis and concurrent suppression of TNF production. J. Leukocyte Biol. 63:101. Shin, H. C., N. Benbernou, H. Fekkar, S. Esnault, M. Guenounou. 1998. Regulation of IL-17, IFN-γ and IL-10 in human CD8+ T cells by cyclic AMP-dependent signal transduction pathway. Cytokine. 10:841. Platzer, C., C. Meisel, K. Vogt, M. Platzer, H. D. Volk. 1995. Up-regulation of monocytic IL-10 by tumor necrosis factor-α and cAMP elevating drugs. Int. Immunol. 7:517. Yee, C. S., Y. Yao, P. Li, M. J. Klemsz, J. S. Blum, C. H. Chang. 2004. Cathepsin E: a novel target for regulation by class II transactivator. J. Immunol. 172:5528.